When you write a lot of R code in a project, or accross project, you will often want to make reusable parts of code. In each project, you can write R files in the Library editor. The project’s library editor is available by going into the “Code” universe (orange), and selecting the “Libraries” tab. You can then write code under a “R source” folder, i.e. a folder that has the “R” icon associated to it. Each time you want to use the functions defined in these R files, you need to use the dkuSourceLibR function, which uses the source feature of R to import the functions in the global namespace. You can create other folders that will also act as R source folders, i.e. that will be available using dkuSourceLibR to all R processes running in the project. Working with multiple source folders is mainly useful when importing code from external Git repositories. To manually edit the list and order of the R source folders, open the external-libraries.json file in the library editor and edit the rsrcPath list. All pathes must be relative to the root of the library editor. 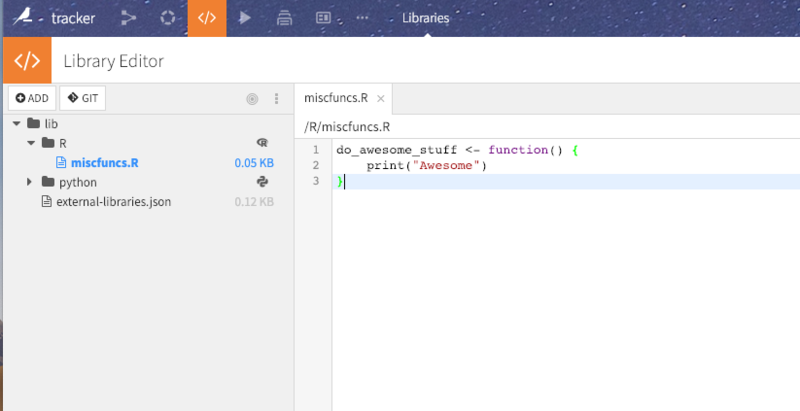 You can write custom R code files in the global R library editor. 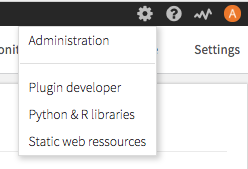 he global R library editor is available from the “Settings” menu. Files that are written here can be used by all R code in all projects. The source mechanism is practical but does not enforce namespacing. To get namespacing, you need to build a complete R package, compile it, and install it (possibly in the code environment) using install.packages. This generally requires shell access on the machine running DSS.